A tower that rises above the Mesopotamian plain to touch the vault of heaven. Two men who achieve a level of intelligence so high that they resemble gods. The mathematical proof that Mathematics are meaningless. An alien language that allows those who read to expand consciousness over time. Kabbalah and the theory of preformation combined output in a Victorian England of our dreams, or our nightmares. Before the arrival of the metahumans, human science is reduced to a footnote on page. In a universe where God exists without any possibility of doubt, is it possible not to love? And if you could program yourself to ignore the appearances, will you risk losing all perceptions of human beauty? Ted Chiang, awarded the John W. Campbell Jr., shines like a new star in the firmament of science fiction. 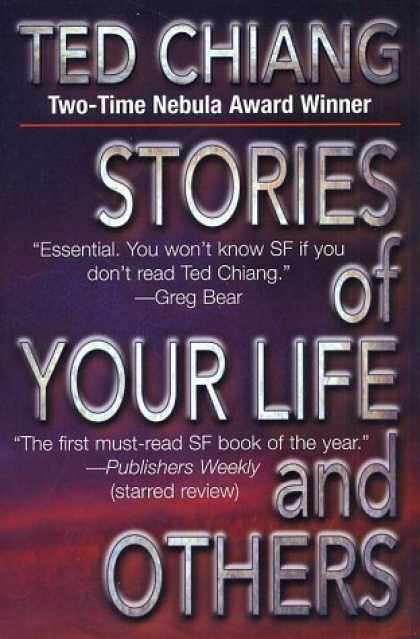 With a Hugo Award, three Nebula, a Sturgeon, a Seiun, a Sidewise and two Locus, The Story of Your Life is an essential book. Tower of Babylon, Understand, Division by Zero, Story of Your Live, Sevent-Two Letters, The Evolution of Human Science, Hell is the Absence of God, Liking What You See: a Documental, What's Expected of Us, The Merchant and The Alchemist's Gate, eight stories, eight masterpieces. Chiang's ideas are full of that originality and wonder that I wish I could find in everything I read but is so rare that it's precious. Magnificent. Ésto es muy interesante, la manera en que el progreso llega tan rápido que te golpea sin piedad y ni siquiera puedes adaptarte a ello. ¡Ah! El futuro es incierto y el final siempre está cerca. I can't believe, given our mutual backgroud, that you two are not saying anything about that wonderful story that deals with a hypothetical proof of the inconsistency of mathematics. Didn't you feel a knot in the throat, the panic and despair of discovering that everything you thought true would prove to be false?